A mobile crusher uses the same range of crushing techniques as stationary models to break stone blocks into smaller pieces of a desired size. It can be mounted on a wheeled trailer or be self-propelled on caterpillar treads. Its autonomy is assured by incorporation of a hopper and conveyor to supply material to the machine as well as a second conveyor to remove finished product. It also may have sieves mounted upstream or downstream of the crusher for better control of input or output size. 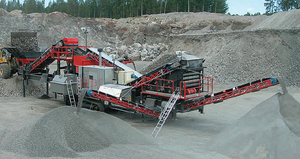 Mobile crushers enable operations to take place close to the extraction points in mines and quarries.